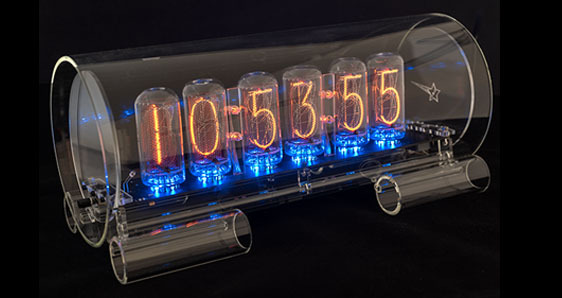 The Glass Clock is designed to mirror and complement the Nixie tube's vacuum tube shape and construction - from the round glass tubes used in the case to the round shapes used in the acrylic support pieces. This clock is 100% designed and manufactured by Cold War Creations. The case is made out of Simax glass from the Czech Republic, and is hand cut and polished. 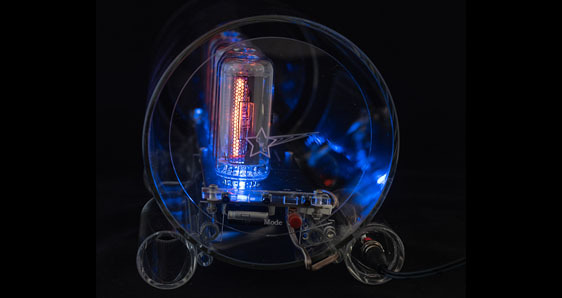 The heart of the clock is a single circuit board that contains the high voltage power supply, processor, temperature, humidity & light sensors, and the Nixie tubes themselves. Surface mount circuit parts are used on the custom flat black circuit board, shrinking the size to emphasize the Nixie tubes and downplay the modern circuitry. The processor is a very low power RISC based 32mHz XMEGA AVR chip. 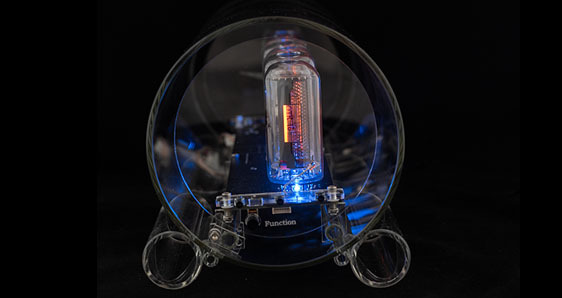 This chip has more processing power then the large computers that originally used the Nixie tubes! The display is direct driven to eliminate the "blue spot" problem (this occurs when the tube is improperly driven). Time, date, humidity and room temperature can be displayed on the clock. The different displays alternate, with time first, followed by date then temperature. All three can be selected, or Time/Date or Time/Temperature. The display has many options. 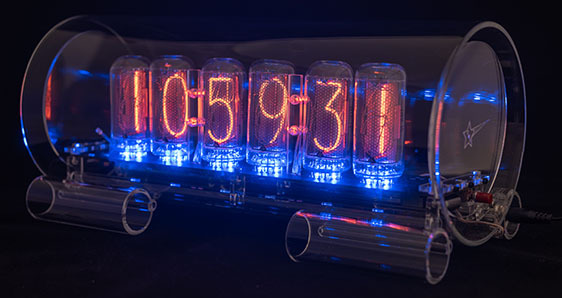 Digits can crossfade, slide across, turn off at a programmable time interval, and a light sensor that adjusts the display intensity - the brighter the ambient light, the brighter the Nixie tube display. 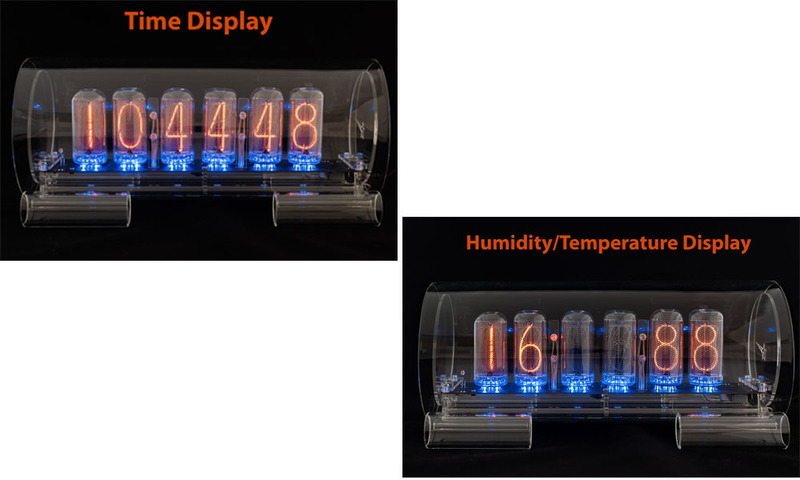 The display can be setup to go on/off at programable times, off on weekends (or weekdays). Also can optionally be set to turn off display when it is dark. This view shows the different displays on the clock. Blue floor dual LED lighting is standard on the clock. Can be turned on, off or off when the display is off (nighttime, weekends, etc). 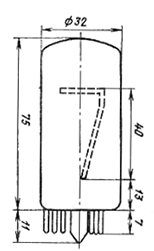 Dimensions of the Large Glass Clock #3 IN-18. The tubes used in this clock are Soviet (Russian) military tubes. 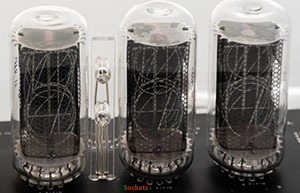 The Soviets, seeing the Western Nixie tube, came up with their own versions with similar sizes and shapes. Unlike the West, they manufactured Nixies well into the 1980’s. 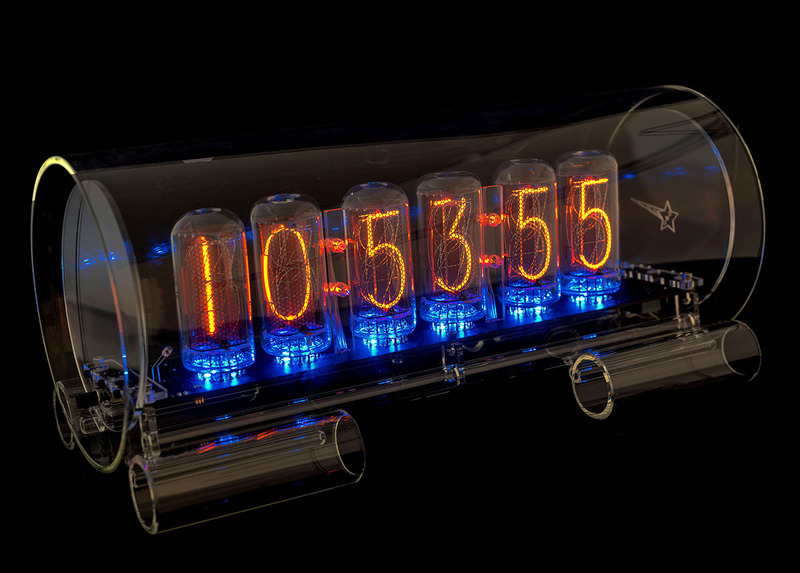 The ИН-18 version of Glass Nixie Clock #3 uses the large Soviet ИН-18 tubes. 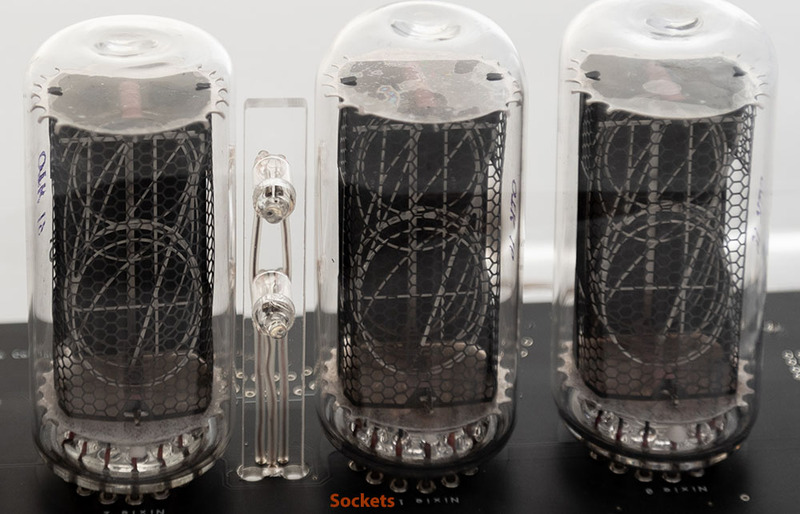 They have a digit height of 40mm, one of the largest Nixie tubes. 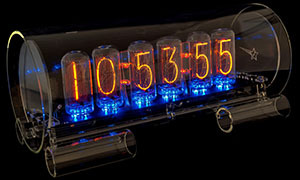 Nixie tube life is usually 100,000 to 200,000 hours. 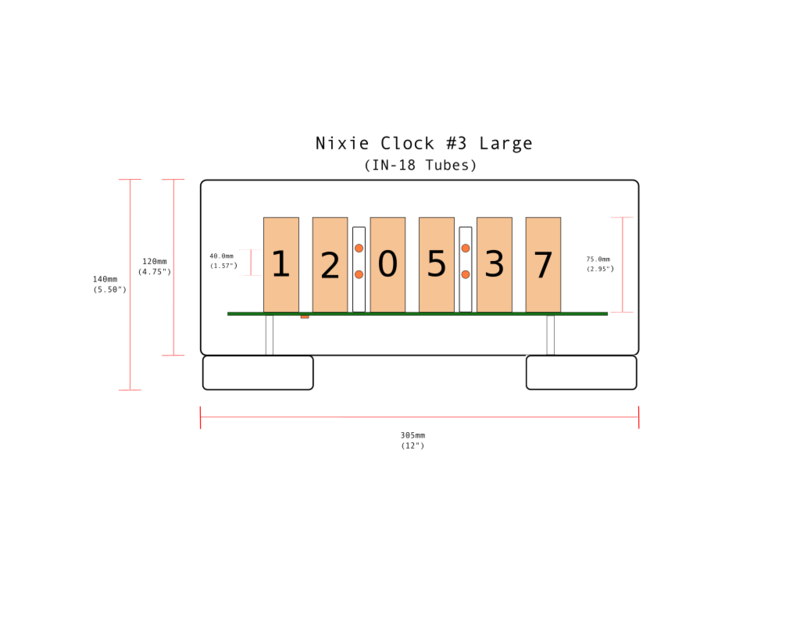 See Burroughs Nixie Tube Lifespan article. The purpose of a clock is to tell time, no matter how fancy the display. A watch crystal is used for precise time keeping. 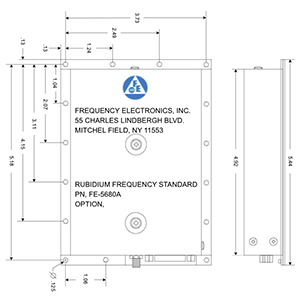 Each clock is individually calibrated with an atomic clock time base (Rubidium Oscillator). Also the temperature sensor on the clock adjusts the time depending on temperature – further increasing accuracy. The clock also will keep time when there is a loss of power. Instead of a battery backup, a super capacitor will power the time keeping circuitry (at least 8 hours). Unlike a battery, a capacitor never needs to be replaced. Also, Auto DST (daylight saving time adjustment) is included, the clock will automatically adjust time for daylight saving time. DST rules options for North America, Europe and Australia (or no auto adjust at all). Also, a GPS module is optional, which will automatically keep the time synced - no need to ever adjust the time. 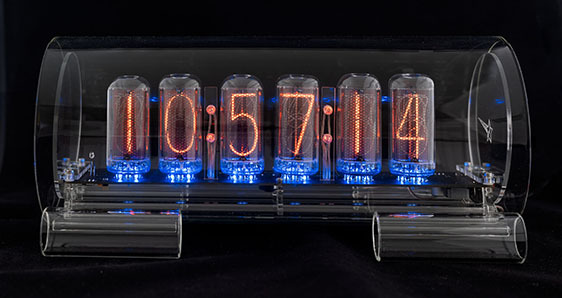 All the Large Glass clocks have socket pins for the Nixie tubes. This means no more soldering/unsoldering to replace tubes. The socket pins are very small - does not change the look of the clock. 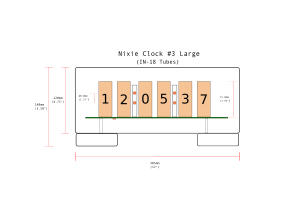 The Large Glass Clock #3 will take any IN-18 tube. No soldering or special parts required.